2 Goalkeepers and 6 players on the playing field. 2 extra players would be on the outside of the field helping the GK retrieve balls which missed the net. 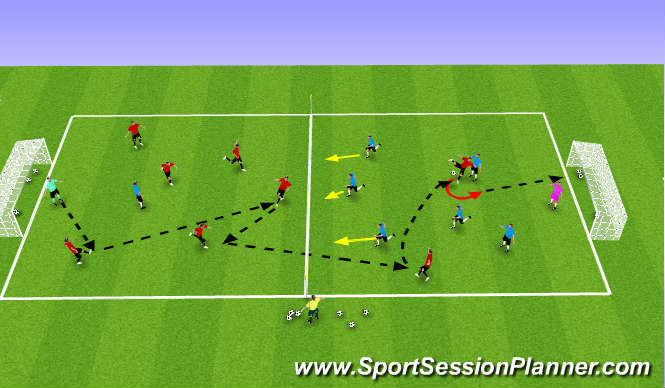 Play starts with one team and their GK who distributes the ball to one of his/her players. No team can cross centre or stick their leg across centre to block a shot as defenders. Each player has maxium of two touches. The objective is to shoot on goal to score. The defenders are to work at blocking the shot if possible. Play can be advanced to include the two extra players in the opposition&apos;s half. They must stay in the opposition&apos;s half and look to receive balls to combine, shoot or pounce on rebounds. A maxium of two touches still apply to all players. 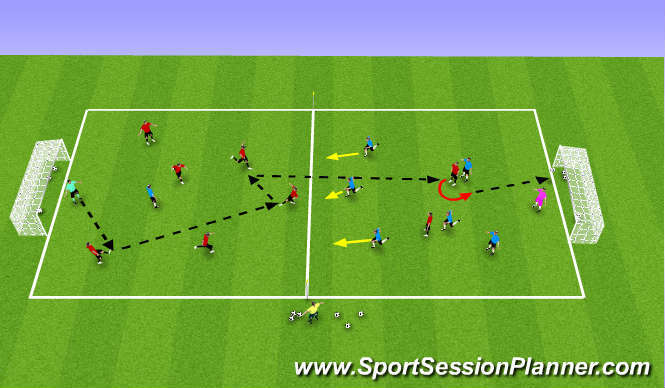 Play can be further advanced to allowing any player who plays a pass to the forwards in the opponent&apos;s half and join them in the attack to score. To shoot is to develop a desire to want to shoot, not be afraid to miss and take responsibility. Prepare body to shoot by opening up and facing the goal. Head down, Chest down, Tow down to keep the shot low.